"Wow, is this a new watch...?" - "No, I only just changed the strap!" Wear a versatile watch that can be ultra sporty and also much more casual at the same time. 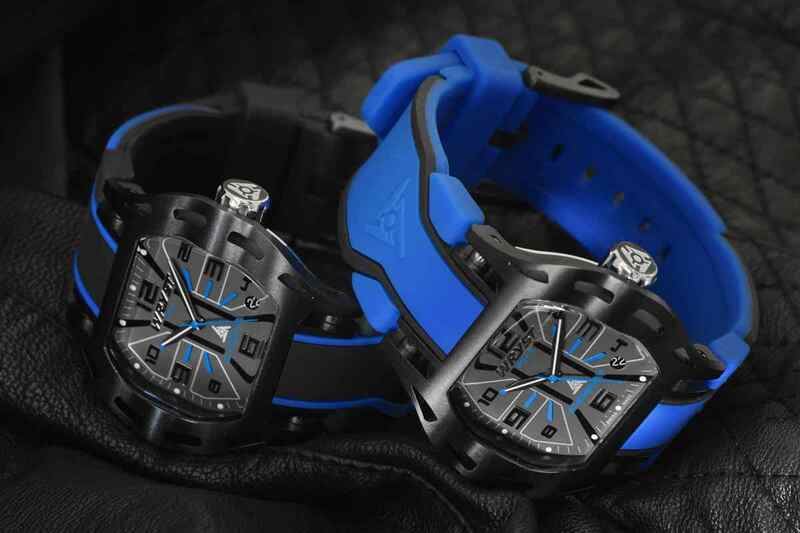 The exclusive Limited Edition blue Swiss sport watch Wryst PH7 with scratch-resistant black DLC coating can literally change look by fitting either the black and blue strap, or the blue and black one - Both included with each watch. The complex design of the bi-color quality silicone strap offered with the Elements collection has required months of development and is totally unique making Wryst timepieces an true asset for watch aficionados and collectors. The disruptive straps of the Wryst Elements PH7 Swiss sport watch is totally new and unmistakable. 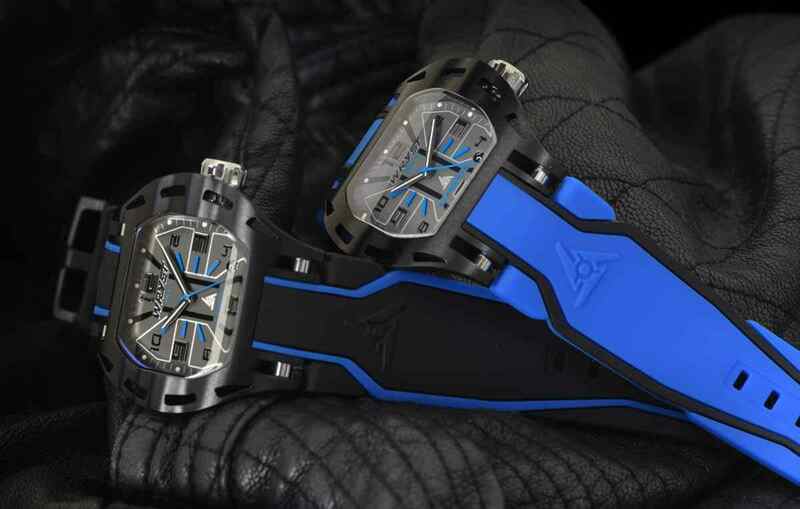 Inherent to the overall aggressive design and disruptive look of the hollowed-out watch case inspired by extreme sports, the watch comes with two different styles. With the blue strap feel on the run, ready to go and challenge new thrills. 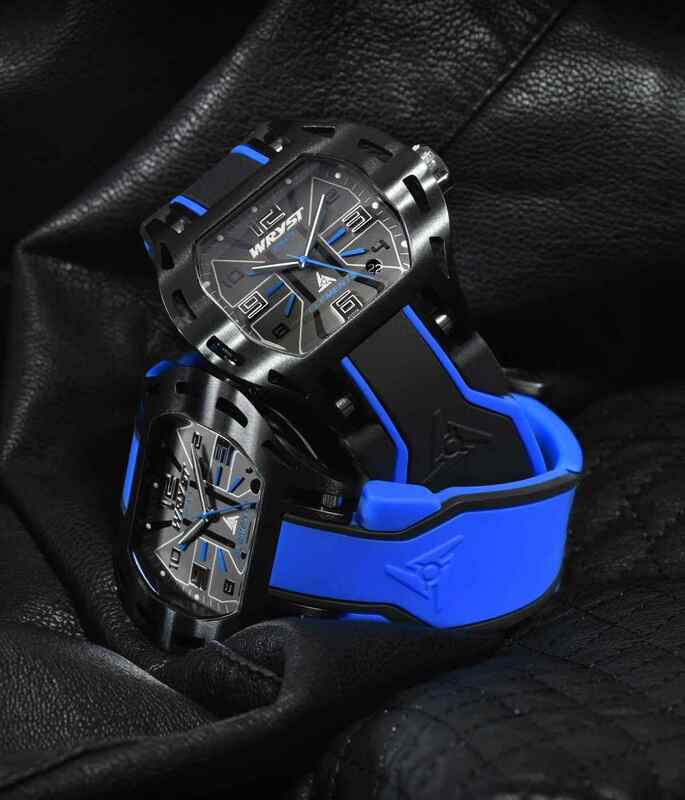 The black version with only thin blue lines on the side will make your watch look less flashy for more restraint during day to day activities. The comfortable watch band is also extremely resistant and protected by a dust-proof coating. With a 22mm size is it also strongly attached between the lugs with a hard plastic insert which is also a unique unforeseen feature of Wryst. We can offer bands replacement where required - Please just contact us as we have not all the straps available for sale at this time on this online boutique. - Engraved signature of the collection on the left side of the watch "ELEMENTS"
- Two straps included with each watch. The PH7 comes with a black/blue quality silicone band and also a blue/black version. - Watches are presented in a wooden box with white leather inlay, signed outer box and USB card for manual instructions and warranty.